líc Paní Svoboda od Barber Quarter (1892 - 1914), ale zombifikovaná a probodená do oka nůžkami. Je zatuchlá a rozpadající se s třinácti šesticípými hvězdami, které ji obklopují a slova "The Barber 2018 50 Zombucks"
Paní Svoboda od Barber Quarter (1892 - 1914), ale zombifikovaná a probodená do oka nůžkami. Je zatuchlá a rozpadající se s třinácti šesticípými hvězdami, které ji obklopují a slova "The Barber 2018 50 Zombucks"
Měděná mince Zombucks Lazebník 1 oz The Barber is the fourth round in the ten round Zombucks series. This round is based on the U.S. circulation quarter design that was minted from 1892 - 1916 under the direction of the Chief Engraver for the U.S Mint Charles E. Barber. It featured Lady Liberty's profile (something not very common before then) with triumphant laurels surrounded by the words "In God We Trust", the year of mintage and thirteen six-pointed stars. But alas, now even Lady Liberty has turned. On the round's obverse she cries tears of blood, her eye having been stabbed with barber's scissors that were unable to kill her. Her torn and mangled flesh and the tattered ribbons of her triumphal cap belie the decay and rot that have overtaken her. This once great symbol of hope and opportunity has now become a warning post of the doom to come. The words "In God We Trust" have been replaced by "The Barber", that sharp image of what Liberty has become. The year of mintage has been replaced by 2018, the year the zombies walk the earth. The reverse side shows a bio-hazard symbol with blood splattered around it, reminding humans of the apocalypse hazards, with the year 2018 and Zombucks. 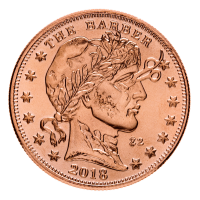 Made from 999 pure copper, the 2018 Zombucks The Barber copper round follows the Walker, Morgue Anne, and Zombuff designs and precedes the six designs yet to come in both silver and copper. Each design commemorates historical coins and figures in numismatic history. Make sure you get your Zombucks The Barber Copper Rounds now and add them to your collection of other Zombucks and Apocalypse copper rounds.